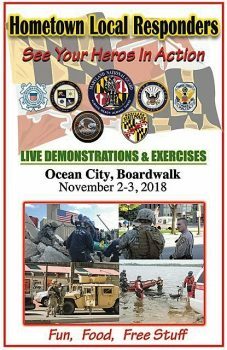 Baltimore MD – (October 26, 2018): The Maryland National Guard is conducting a routine training exercise on Saturday, November 3, with the Town of Ocean City and multiple local first responders in the downtown inlet parking lot. The National Guard, in an effort to validate its response plans, sought the support of Ocean City to conduct this exercise over a year ago. Recognizing the value of testing local response, Ocean Emergency Management engaged and added additional responders to the scenario to ensure realism. As planning continued, additional federal agencies were brought in that would normally have response requirements in the plan. These types of events are done on a predictable basis to help the National Guard synchronize with first responders from all levels of government. The exercise occurs during the Guard’s regular drill weekend, focused on decision-making, coordination and integration with allied agencies in a realistic training venue. Members of the public are welcome and encouraged to come out and see their community working together. The exercise will have over 1,000 National Guard, local, state, and federal first responder’s.